What the heck is FOCUS? This blog was written by Sarah Woodman Kansteiner, a former Marine Public Affairs Officer, military spouse, and mom as the start to a series of three posts! Check in each month for updates on how FOCUS helped her family address challenges and become closer. It was December 2012 and not a happy time. My Marine husband was preparing to deploy to Afghanistan again, for the third time in six years, and this time for a year. As I envisioned my part in this—twelve months running a household with two small boys and a chocolate lab who suffers from a personality disorder (he thinks he’s a beaver)—it really felt like we were both preparing for our own wars. So, when I read an email my husband forwarded me about an upcoming predeployment brief, I can distinctly remember feeling disgruntled, weary, and more than a little wrung out. As I skimmed the email I immediately dismissed the brief in my “been-there-done-that” way, already deciding I was not going to go, right until I read the line about free childcare. About a week later I was seated next to my spouse, arms crossed, assuming I would learn nothing new or useful, but nevertheless enjoying some kid-free time complete with lemon-filled crème cookies. Looking back, my attitude wasn’t particularly commendable, but understandable given that I am a former Marine Public Affairs Officer who once helped give briefs like these and who has deployed once myself, in addition to managing the home front for three others. My perceptions seemed to be panning out nicely when one presenter had the audacity to tell the audience to be sure we counted down the days. You know, he helpfully explained, make your countdown rings and so forth. About this time, the caustic side of my personality took over, and I began dissecting the ways in which I felt this comment was patently offensive. Sure, on the surface, countdown chains or rings are great—fun ways to tick off the time until Santa Claus comes down the chimney or the Easter Bunny hops through the yard depositing candy-filled eggs—but we’re talking about short lengths of time. Days not weeks, and certainly not fifty-two stinking weeks. Can you imagine how long a three-hundred-sixty-five day countdown chain would be? And then if you have more than one kid and each kid wants his own… yikes. It seemed like the worst idea of all time, but on the other hand, I knew he had a point. Certainly, there needed to be some way for our kids (not to mention me) to count down the days and celebrate the fact that each day was one day closer to Daddy coming home again. I remember feeling a little panicky and disappointed that I couldn’t think of any good way to tackle what felt like a fairly straightforward problem when a member of the FOCUS team was introduced. I didn’t recognize the acronym, so I perked up, wondering what this FOCUS deal was all about. The woman politely explained FOCUS stood for Families OverComing Under Stress and that it was a new program designed to help families build up their resiliency in preparation for highly stressful events such as a deployment. As much as I tried, I could find no cause to criticize or belittle anything the woman said, and I was a little bewildered to find my “too-cool-for-school” self surreptitiously taking notes, scribbling her number on my otherwise dispensable issued deployment booklet a few moments later. Despite my own deep-seeded reluctance to ask for help, and despite the fact that I inherently knew family counseling would be about the last thing my Alpha Male Marine would want to do in the all-important dwindling time before he began his next tour in the sandbox, the next day I found myself making an appointment for an initial interview without even consulting him. It was a rare, unilateral decision, but I just knew in some unexplainable way that it was the right thing to do, and I was willing to weather the ensuing flak-storm that did ensue once I broke the news. Looking back now, on the other side of a yearlong deployment, I am truly shocked to be able to say it wasn’t the worst year of our lives. I certainly wouldn’t volunteer to do it again—rest assured, the deployment was still full of the fairly predictable hardships, such as unexpected car breakdowns and the threat of major appliance failure—but the counseling we received through FOCUS prior to and during the deployment, really helped make our family stronger and better able to deal with the ups and downs and in-betweens of carrying on life at home with Dad seemingly millions of miles and days away. Before FOCUS, I survived deployments. After FOCUS, I realized I could thrive during a deployment, and that’s a mindset I hope to be able to sustain throughout the rest of my husband’s career. This is the first in a series of blogs where I will explain the lessons I learned through FOCUS sessions and how they panned out in real life. I hope other military spouses will find them useful and perhaps inspire them to consider giving the folks at FOCUS a call. Out of all the demands for our time these days, this is one investment that stands to have a great return. 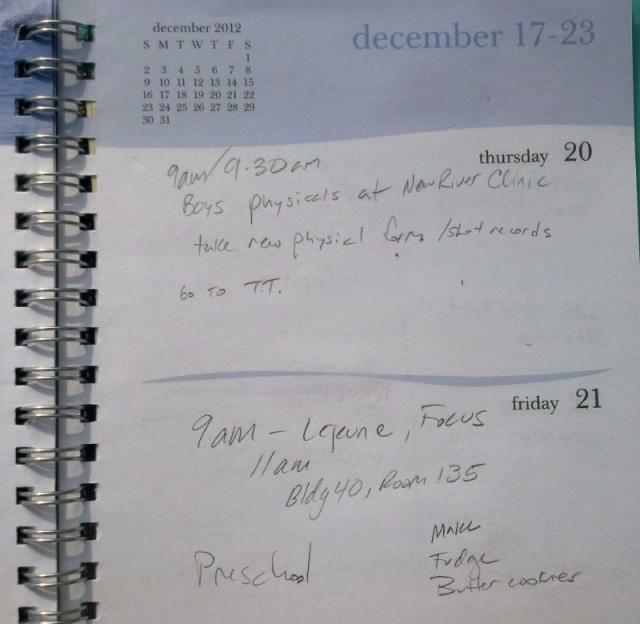 December 21, 2012: Less than two months before my husband deployed, we had our first FOCUS appointment. I had to sandwich it in between doctor’s appointments and holiday baking while the boys were at preschool, four days before Christmas, but it turned out to be time well spent.